Do you all watch The Real Housewives of Beverly Hills? Let me re-phrase that, are you guys as obsessed as I am with The Real Housewives of Beverly Hills? I unabashedly love that show. Beverly Hills is definitely up there in my top favorite locations in the franchise. The drama is real, but more than that, the glamour is on point. Those women know how to turn it up. And no one is more dazzling than Yolanda Foster. She nails effortless glitz every time. What I love about Yolanda’s style is that she never looks uncomfortable. Often, she’s in jeans and flats and looks just as amazing as anyone in a tight dress and stilettos. What Yolanda really does right is pick the perfect flats. Her shoes always pull her outfits together in the most perfect way. So, I thought I’d do a little digital window shopping and pick out the best flats and share them with you! Starting with a bang here. 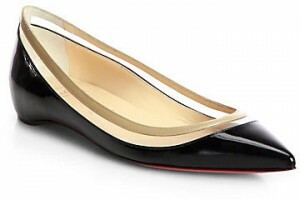 I literally don’t think you can find a more perfect or more versatile flat. It’s exquisite. I love how it’s super structured, so you’ll still look very put together even though you’re not wearing a heel. And the mix of neutral colors keeps these in a basic color scheme that will go with most outfits, but makes sure the shoe is still eye-catching. I really love these. Yolanda, my flat fashion guru, loves a loafer, so I had to include something loaf-like in this round up and here it is! I went with something adorable and whimsical because why not? These kitty-faced shoes in an electric pink are sure to catch some eyes. And why not? Flats can be fun, too! Nothing sasses a shoe up like a lace up. And in this case, the detailing up the calf takes this from a basic pointy toe flat to a va-va-voom night out shoe! The shoe comes in a few colors, but my heart is sold on the royal blue, not just because that’s Yolanda’s signature color. But, that’s definitely part of the reason! Flats are often associated with preppy looks, but not these bad boys. Leave it to Valentino to find a way to rough flats up and give them total rocker appeal. The Valentino signature studs make even more of a statement on flats than they do on heels, in my opinion. Pick up this pair if you have a concert to go to and want to be able to rock all night long…or just look like you’re going to rock all night long! If you’re looking for something very classic, incredibly wearable, timeless and the opposite of blah, then this is your pair. Such a subtle change on a class black flat but boy does it pack a punch. You’ll be making a statement without making a statement, you know? There you go! My favorite flats available this season. You know I love my heels, but sometimes your tootsies just need a break. I wouldn’t mind taking a stiletto rest day in any of these amazing flats. Which one is your favorite?